How to Find Mobile Search Queries on Which Your Site is Ranking? We all have made this a habit to identify the top search queries that are sending traffic to the site without the need to filter them by mobile and desktop search traffic. Considering the growth of mobile devices that we witnessed in the recent years, it is more than necessary to identify keywords that are sending it traffic to your site from mobile devices and plan your strategy accordingly. One of the lovely graph trends that I often witness when I start comparing the mobile traffic with the desktop traffic and that is the mobile traffic does not drops suddenly. It remains constant as compared to the desktop traffic. We all know that within a few years most of the traffic Google will provide us would be by way of mobile, tablets and other digital devices. So, what is your strategy for identifying keywords sending potential traffic from mobile devices in order to plan a possible optimization strategy. Well, let me discuss a simple technique that will enable you to identify the keywords that are sending mobile traffic to your website. This is achieved easily with the help of Google Analytics. 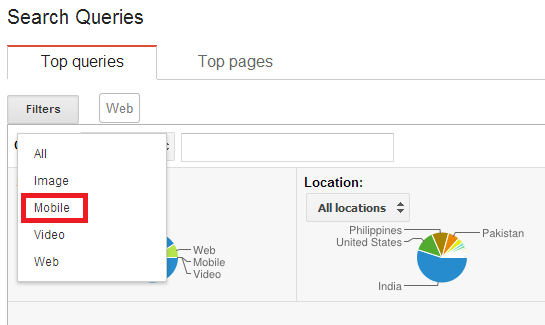 Step 1: Move to "Search Queries" section under "Search Traffic" in GWT. Step 2: Click on 'Filter" and choose "mobile" under search. You will see a list of keywords that are generating impressions and clicks from mobile devices.